FIRST REPORT, 3:39 PM: Thanks for the tips. Guardian One has been out over North Shorewood in what a deputy tells us is a search for at least one suspect – another may already be in custody – related to a stolen car. 4:41 PM UPDATE: Guardian One’s crew reported via Twitter that one person was in custody, two others being sought. 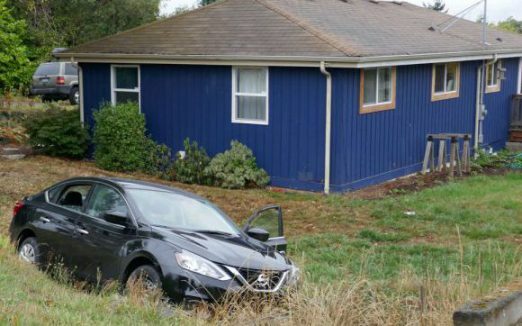 And we’ve added a photo courtesy of Gill Loring – the stolen car, which had gone into a yard at 20th SW/SW 102nd. Don’t have one, sorry. We are updating the story – one person in custody, two sought. Car was ditched at 20th/102nd.